this cute canvas photo serves two purposes. not only is it super chic artwork of one of my loves, but it doubles as a cover for the unsightly alarm panel. ta-da! not only does it hide the ugly alarm panel from friends and family, but also from strangers. 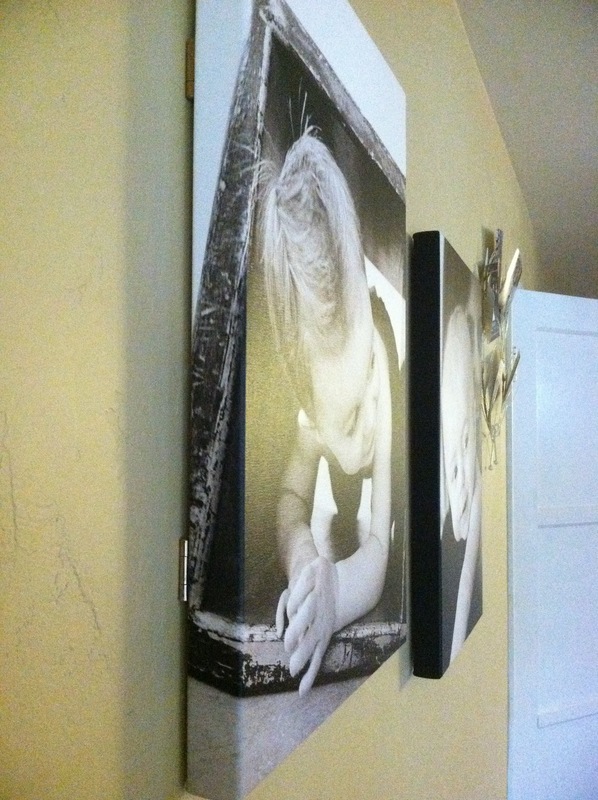 simply attach two flat hinges first to the canvas (ordered at canvas on demand with uploaded photo from our collection) and then to the wall. (i just picked the hinges up at home depot for cheep). view when canvas is in open position to reveal the alarm panel. side view of both canvases on the wall in our entry. you can see the hinges from the side on the one that is hiding the alarm panel, but barely. This could work for the thermostat, too! Since I work at a heating & air company the thermostat one really bugs me... If you cover it up it will make your power bill go up!! The thermostat has to be able to tell the temp in the house to work properly.. If it is covered it could make the unit run longer before it can tell what the temp is.. Which in turn will cause more energy to be used and a a higher power bill..
A frame around one is a great idea! I second what the first Becky said. Moved into "new" old farmhouse with a brand new heat pump. The manual was stuck at top of thermostat and I left it there, also had a small lamp on the table directly under it. Had problem of heatpump not coming on or off properly. Learned from the service guy that the papers were covering the top temp detector and the light was heating the bottom one. Ignorance is not bliss! As it says repeatedly throughout the post...this was an alarm panel...not a thermostat. All one would need to do is adjust the thermostat accordingly. Instead of setting it at 72, set it to 75 or whatever difference is needed to factor in the covered area. You're right, Ignorance is not bliss, nor is being stuck in old thinking patterns. Please don't use it for a thermostat. Love this idea! Found your post on Pinterest!! What a great idea! I made a few (well, maybe 8) canvases recently and displayed 7 of them perfectly in a cluster. Now, I have one left over and no idea where to put it. Now I know! THanks so much! 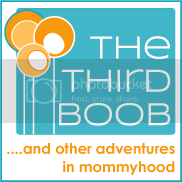 Also, you guys are so entertaining to read ... and I am awarding you the Liebster Blog award. Head over to my post "I am so honored" to check out where I linked up to your site! Happy Blogging! thank you so very much....and welcome! we are glad that you found us!! "This could work for the thermostat, too!" - I don't recommend that since a thermostat reads the room temperature. A canvas would block the air. The thermostat has a gauge in it to detect the air temp in the room, though. Won't this cause the furnace not to kick on since you're covering it? i used this for an alarm panel and unfortunately i don't know enough about thermostats to know if it would work for them too or if it would mess with the efficiency. :-( sorry! Brilliant! I love decorating that is both beautiful and practical! I have an awful red switch in the middle of a living room wall...this is perfect! Maybe pretty fabric instead of canvas to let the air flow through easily. What a fabulous idea! 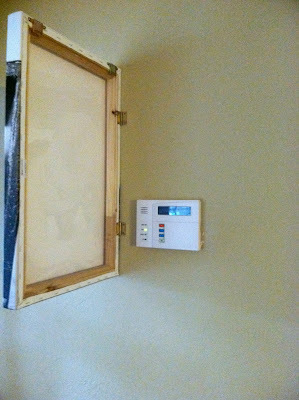 I have been obsessing over how to move our doorbell box and an old, unused thermostat, but this is the perfect solution!! Thanks for sharing! 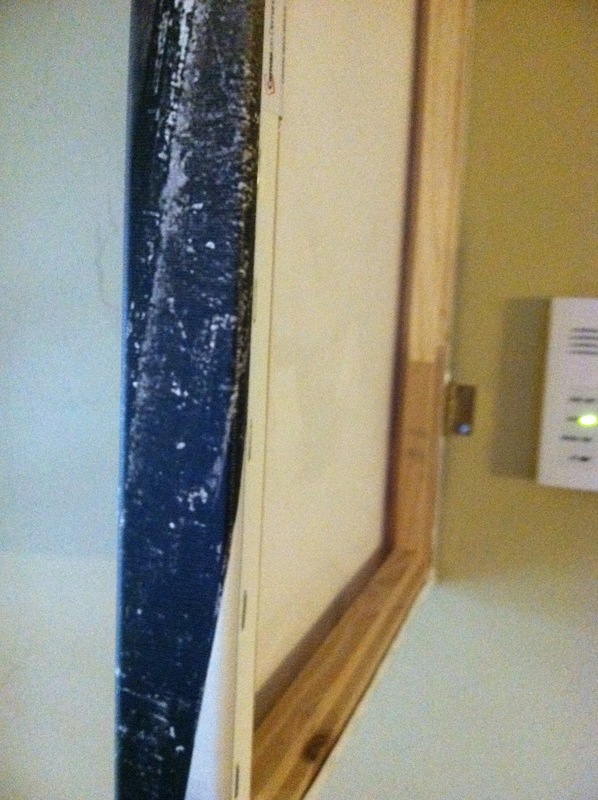 If you were to paint the back edge of the hinge to match the wall it would make the hinge less noticeable. Seems like a clever idea to me but my hubby is an HVAC guy and says this isn't something one should do. aha, I just now read it is an alarm panel...I just saw the pic on pinterest and thought it was a thermostat. Silly me! I'm going to do this to hide my necklaces! Thanks! Don't hide valuable behind pictures, that's one of the first place thieves look in a break in. We were robbed when I was young and they had ripped down pictures, gone through dressers and even found my moms money stash in the freezer that was wrapped in tin foil. A thieve will know all the good hiding spaces. come up with your own. My husband and I own an A/C company, and although I love the ingenuity behind this idea, Becky is correct. Thermostats measure the tempuratures in close proximity, in order to trigger off and on a/c or heat. If the T-Stat is covered, it can't function correctly and that will be reflected in energy consumtion and your monthly bill. Love the idea and like others I'm wishing I could cover my thermostat... seems you have several knowledgeable people onboard, maybe somebody could comment on my idea (started by others I've read) to cover the thermostat with a light fabric, maybe vent the sides of the frame and adjust the temp up or down a couple degrees as needed to compensate...?? I used a vintage frame with some really light gauzy fabric, kinda looks like a window with curtains and our service guy said it should be okay! What about doing this to cover up the electrical panel? We rarely need to access it & it's so unsightly. Sarah from the TV show "Sarah's House" used a picture frame with hinges on it to cover the electrical panel in her laundry room. Both of these ideas are seriously genius! Thanks for sharing with us Chach! Just finished hanging a large canvas over our thermostat. I did leave a small gap.....1/8 in......on the edge closest to the thermistat. I also used a small square of Velcro in one corner to keep it from accidentally opening. Turned out beautifully! Thanks for the brilliant idea. That's a really cool idea! I never would've thought of that. I could that with my thermostat, too. Awesome! Just saw on Pinterest! I did this about 6 years ago for the same reason! I've received dozens of "Wow!' comments over the years. Fantastic idea. It would work great to hide my circuit breaker box that is highly visable. It seems you've had to tell a lot of people that you did this with an ALARM and not a THERMOSTAT (even though you stated that in your post that it was an alarm). I'm glad some people have pointed out that it probably wouldn't be a good idea for a thermostat though. Maybe you should put an update in your post itself? Saw this on Pinterest. I rarely go to the source for pins, but this was too good to not give props. Seriously genius! Thanks for sharing! thanks! so glad that you found us! Love this idea! When my husband had surround sound installed in our family room, one of the front speaker panels is right smack in the middle of a space I would love to decorate. I am totally doing this! Great idea. I think plan on doing this. I am going to recess the hind into frame and see if this method will eliminate seeing the hinge from a side view. Will let you know if it works. This is NOT simple but a simple idea made complicated. Y not hang the frame on a single nail over the panel! Because then you would have to take the picture down every you set the alarm and then put it back up. This way is simple. Great solution for covering the alarm. Thanks for sharing! Just tried this on my thermostat, I left a small gap and it doesn't seem to be affecting it. Loved the idea! I'm curious about whether it lays flat on the side without the hinge? I was thinking that it might make sense to add a small magnet on the other side, to keep the frame shut? I've had stretched canvas frames warping ever so slightly at my beach house with high humidity. Any thoughts? a magnet sounds like a great idea. we haven't had any problems with warping but if you do, i'd definitely try something to secure it! We did this in our finished basement with the electrical box! Just did this on a side of a kitchen cabinet. It now hides all of our keys. I used the 3m removable hooks for hanging the keys. Love it! I am totally doing this with my electrical panel in my basement! I have been looking for ways to cover it! Great idea! I think the whole idea is dumb. I actually just did this with a piano hinge over a 50" flat screen in my bedroom. Put the hinges on the side opposite the people enter. Do you think this would work to cover a doorbell box? I see it's been almost a year since you posted. I'm curious to know how it's held up over time. Still working well? 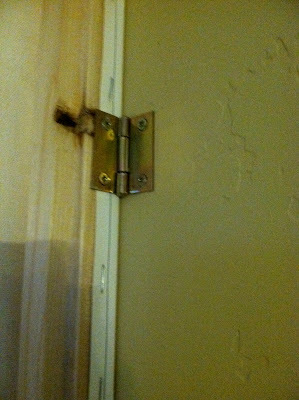 I thought about this, but the screws are so tiny, there was no way they'd go through the drywall to hit a stud. Just wondering if you have drywall and it it all stayed in place? Thanks! everything still works perfectly. screws are holding tight and everything still looks great! we have it in drywall without any problems. Getting ready to move to Cali and I can't wait tiu try this in the new house! This idea is so brilliant! I just have one question, my alarm is pretty big. It probably sticks out about 2 inches or so. I've never ordered a canvas, so I'm not sure on their size. Will it really cover it? A frame wont, which is why I'm unsure. Don't want to invest in one if it wont work! 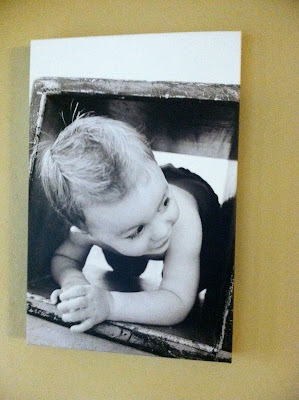 you'll want to measure your alarm and then check with the canvas printing company to see the depths of their canvases. let us know if it works! I want to do something like this to cover the fuse box. I have a small frame over mine and i didn't have to hinge it...it just fits and i can lift it on or off.. I'm going to use this to cover an unsightly electrical panel box in my hall!